uhhh, so my friend Amy is going to be working on a banner for me. I have to collect a bunch of photos, so it's going to take some time. I absolutely went on a thrifting spree this week. I didn't get a lot of results, but I got to spend some time with my boo & got some fresh air. My absolute favourite find this past week are this orange atomic glasses / tumblers. I had seen one at Goodwill in the summer, just one, in moderate condition, wrestled with the idea of bringing it home, but then those haunting words of my fiance "NO MORE GLASSES" rang into my head & I passed. I mean, it wasn't a necessity glass, if it were tip top condition, then yes. It was. I think at least 75 glasses & cups have come into the house since that rule has come into effect (shhhhh!!). The only piece of Pyrex to enter the apartment this week - a JAJ Snowflake. Can anyone confirm if this piece came with a lid? I'm going to collect this pattern as this is a pattern I won't be afraid to use & will still look beautiful served near Christmas & the winter months. It needs a cleaning, but I'm not feeling to hot right now. This set of Copco salt & pepper shakers is really neat. Huge, but neat. And speaking of S&P shakers, why do I only ever find the woman when it comes to Americana sets? I'd really like to add at least one set to my collection, but not pay an astronomical price from an antique market or eBay. My boyfriend also sat in front of the cash laughing at me while I was paying for this still in the box Tupperware play set (all there, too). He wasn't laughing when he saw it sold for $41 on eBay recently. 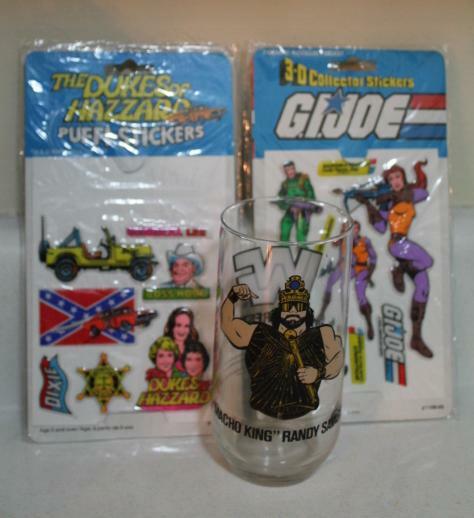 Some vintage stickers & a Macho King WWF glass. If anybody ever sees some funky vintage stickers out there from the late '70s or '80s ... wanna buy them for me & I'll pay you back? (doesn't hurt to ask!). I collect them & I don't see them very often. I bought some more stuff, too, but thrifting is going to be light until the new year, so I'm going to keep some of it until next week. This week is going to be busy, busy, busy. Although, I'm got some vintage photos of aluminum trees to share & my early gift of Pyrex from my beautiful boyfriend. Thriftosaurus Thrift Haul Linkup #13! The atomic glasses are the bomb. No pun intended. I will keep an eye open for stickers. vintage wwf product is on my thrifty wish list! my boyfriend would love them. Not to be a creeper stalker or anything, but I dig your blog. I'm checking out your links. I really should be packing. Ack! My family had that tupperware set! We used it on roadtrips. Eah of the 4 kids reserved a colour. I was green! I have such a horrible fascination for vintage drinking glasses too. And if they are minty. They are coming home with me. Still in the box Tupperware play set?!?! I died! I'm pretty sure that my sister would have hurt someone if they came between her and those orange atomic glasses! I will definitely be on the lookout for stickers for you. Maddie hits the office supply and craft aisles first at all of the thrifts we go to. That play set is fantastic, and I love the glasses. And you know you can't go wrong with snowflake Pyrex. And I'll also keep my eyes opened for stickers for you. The playset and the copco salt and pepper are my favorites. Thank you for hosting. Cute tupperware set! id have bought that too! If you ever need to get rid of those glasses, ya know, to keep the boyfriend from having a stoke or something :), I'm your chick! Great finds and if I see any old school stickers I'll pick them up for you. I ADORE the nautical star glasses! Pshaw 75... that justmeans 73 people can come over for drinks!